Quality in Adventurous Activities: An Explanation of Accreditation Badges by Brian Ogden, Chair AAIAC. Legislative changes have taken place since this article was written. For the latest information refer to the HSE website and search for 'adventure activities' or try this link to the Adventure Activities Licensing Service. Recent years have seen considerable growth in outdoor recreation and the adventurous activities that take place outdoors, be they in traditional pursuits such as hill walking, canoeing, sailing, or more modern trends like mountain biking, canyoning or coasteering. Many people started their interests during their school years, often attending Centres of the Local Authority, commercial providers such as PGL, or the YHA or Outward Bound. Other entry points include Scouting, Guiding or participation in the Duke of Edinburgh Award Scheme where each level has an Expedition section to complete. Some youngsters get hooked straightaway and go on to pursue their hobbies and activities to high degrees of competency and qualification through training courses at recognised centres of the National Governing Bodies for sports and activities such as those of the RYA and BCU, or National Sport Centres such as Plas-y-Brenin, Plas Menai, Glenmore Lodge or Tollymore in Northern Ireland. However, it is probable that the majority do not follow up their initial introduction immediately. More and more, though, are returning to the Outdoors a little later in life as people head for upland or coastal areas to refresh and practice what becomes a hobby or perhaps take part in a new adventure activity whilst on holiday. Adventurous activities by their very nature have a greater element of risk - in part the thrill and excitement of the unknown or unpredictable is part of the attraction, the sense of enjoyment, independence and fulfilment that comes for new achievement. These days we are frequently reminded of the need for healthy life styles, greater exercise and agility in both mind and body. In all but a handful of cases participants return unscathed, unharmed and safely, having had an enjoyable and rewarding experience. Look in any Outdoors magazine, Tourist Information Centre or National Park Visitor Centre to see the literature and advertisements that are testimony to the growth in provision of adventure or activity holidays in our tourist destinations. Countless companies, organisations and sole traders have set up in business to provide activities, plan journeys, specialist sessions sometimes linked to accommodation and other day ventures. There is anything from Mountain Biking to Horse riding, White Water rafting and guided walks to the highest peaks, if you want them. How safe then are the practices and procedures of the providers or the participants who “go off on their own in increasing numbers”? Those of greater years remember the Cairngorm Tragedy of 1972, and more recently the Lyme Bay disaster of 1993, each leading to the sad loss of young lives in one event. Just last year we could watch the spectacle on T.V. of a Lake District fell race having to be called off after it had started because of abominable weather and the rescue of runners cut-off in rising waters. In the period November 2009 - January 2010 the Teesdale and Weardale Mountain Rescue in the North Pennines has been called out over 25 times and Highland avalanches had claimed at least four lives by February this winter. As has been said, adventurous activities carry a higher element of risk and accidents do happen. The adventure activities industry is seeking to manage that risk through a continuum of accreditation of providers and encouraging any participants whoever they are and whoever they go to to provide their adventure to ask whether the provider, company, Centre etc. has an AALA licence, Adventuremark or LOtC badge for adventurous activities. These terms need some explanation to describe how they make a continuum and what they cover. AALA was set up in 1994 by the government in direct response to the Lyme Bay tragedy in which 8 young canoeists drowned whilst on a course from a Centre in Dorset. 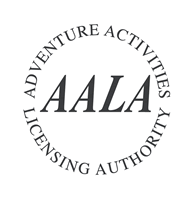 Any provider supplying defined adventurous activities in the UK for young people under 19 years of age must now have an AALA licence to do so. It is principally Local Authority Outdoor Centres and those run by commercial companies and charities for young people of school age who need this. Adventure Activities Licensing ensures that activity providers follow good safety management practices for activities in scope. It should allow young people to experience exciting and stimulating activities outdoors without being exposed to avoidable risks of death or disabling injury. Activities in scope of Licensing are: climbing, abseiling or scrambling over natural terrain and cliffs; trekking on foot, horse or cycle over remote hills or mountains; watersports on the sea, tidal waters, large lakes or white water; exploring natural caves underground. There are approximately 1170 licenced providers throughout Great Britain. Licensing does not apply in Northern Ireland. Accordingly, if your child goes on a school outdoor activities course or holiday offering in scope activities then the venue Centre provider must hold an AALA Licence. A licence is granted after inspection for between one and three years, before reapplication and reinspection. A fee is charged by the Licensing Service for this – currently £800 - but there is also a significant sum of tax payers money supporting the system [£670,000 per year]. AALA was formerly administered by the DCSF but is now under the Health & Safety Executive. The licence may not cover all the activities taking place because some, including newer ones, are not included within the scope of licensing. Accordingly, if a provider does not cater for young people under the age of 19 or undertakes activities that lie outside the scope of licensing there need be no accreditation to assure users and customers that practices have been inspected and/or conform to standards of safety recognised as acceptable good practice by the industry. It is estimated that about 75% of all adventurous activity provision lies beyond the remit and scope of licensing. In reality therefore, there is little short of finance that stops you or I setting up an adventure activity business with no check on safety credentials, experience, qualifications, expertise or equipment. Let it be said immediately that there is no evidence of hoards of unscrupulous operators entering the industry but not all operators are necessarily aware or sure of all that can be done to ensure their own commercial success or the safety and well-being aspects of their customers and users. In 2005 the then DfES [now DCSF] commissioned the Adventure Activities Industry Advisory Committee [AAIAC] to research and develop a parallel system of accreditation which could sit alongside licensing to cover activities which lay outside its scope and also providers of activities for people over 19. AAIAC has developed that parallel system , using expert consultants and taking much of its methodology from the licensing system. It launched it as AdventuremarkR in 2009. AdventuremarkR is a system accrediting the safety aspects of adventure provision, looks at the way practices and procedures are carried out and uses a similar inspection regime. Staff qualifications, emergency procedures, briefings and developments, standard locations used as well as the quality of equipment etc., are all part of the inspection accreditation regime. AdventuremarkR can be gained by a provider making application to cover any adventurous activity, provided for any age group and anywhere in the U.K. It is not restricted to under 19s unlike licensing and covers England, Wales, Scotland and Northern Ireland, and centres abroad if the badge holder operates from the U.K.
During the research and development phase of AdventuremarkR. the government in England via the DCSF has been pursuing a curriculum initiative called Learning Outside the Classroom [LOtC]. This is designed to stimulate and extend learning and teaching methods, using anything from the school grounds, local area and wider educational visits as we know them. It can apply across any subject area and has been seen to pay handsome dividends in terms of pupil progress. After all, history or geography do not take place in classrooms, literature is normally about happenings outside them, mathematical understanding develops much more extensively if it is applied to the real world and science and technology become applied at home, at work and in the adventure activities sphere – so let’s study things where they originate as well as within the confines of school buildings. In seeking to extend learning beyond the classroom and school it became the case that a system of badging for providers who service the educational demand elsewhere ought to have some form of accreditation to safeguard schools, their students and teachers and confirm that acceptable standards of good practice are being applied at those learning venues. Accordingly, there has been in operation for just over a year now an LOtC Quality Badge system for providers to apply for in ten learning strands, including adventurous activities. The Quality Badge is open to all organisations providing learning outside the classroom experiences. The route any organisation takes to achieve the Quality Badge will be determined by the degree of risk management required to manage the activities offered. Learning experiences in museums, theatres, places of worship constitute Route 1 for the activities with least risk, whilst field studies, expeditions, study tours, farm visits and adventurous activities constitute Route 2 where the regime is more rigorous . Thus adventurous activities providers and organisations can be accredited in three different ways, depending on their circumstances and the market in which they intend to operate. AALA and LOtC accreditation apply in the educational and children’s services age range only, AALA to Great Britain and LOtC to England only, since education is a devolved responsibility elsewhere in the U.K.. On the other hand AdventuremarkR can be obtained for any adventurous activity covering any age range and is U.K. wide or overseas if an offshoot of a British organisation. AAIAC is the award holder on behalf of the LOtC Council for the LOtC Quality Badge in adventurous activities and can accredit centres for this to supplement an AALA Licence or AdventuremarkR as appropriate. Take up of the badging system so far has been less than anticipated and hoped for largely because the public and, in particular as yet the educational world, is insufficiently aware of what has happened and is now available. 460 badges have been awarded across the eight sectors of the LOtC Quality Badge system in the first year. AAIAC has awarded 87 in the same period including some major schemes of Sport Governing Bodies with more in the pipeline. 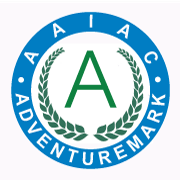 AAIAC invites anybody wishing to use an adventurous activity provider, any parent/carer thinking of sending their child on a school organised visit or adventurous activity to simply ask the provider or teacher at school – does where we are going have any of the three badges AALA, AdventuremarkR or LOtC. If they do that gives you, your child and family greater protection and the security of knowing that accreditation has been awarded on the basis of industry wide standards of good practice, if not the licensing regime. If they have not, ask whether they are in the process of seeking one of the badges and, if the answer is no to either question, then it is suggested you look elsewhere for somebody/a provider who has. Please tell the school and teacher to do the same! If sufficient customers and users start asking now, we shall build up a momentum that allows the accreditation system to become more or less universal because providers will soon learn it becomes at least desirable if not a necessity. In that way we have a better, safer industry and experience for customers/users who can be surer that things will be done correctly in activities which do have an inherently greater risk – ones that can and should be properly managed. After all, we are in the business of preventing accidents and doing our best to provide fun, enjoyment, exhilaration and achievement etc., and return home safely every time. That is what the industry wants. Those who venture out on their own, and it is a huge number of people these days especially in our tourist hotspots, can have the benefit of the previous experience from school days, activity holidays, from organisations such as scouting, guiding and the DofE. etc.. Such experiences are “provided” from a rich variety of sources and “train” people in the craft of their sport or activity so they become proficient themselves. Accredited providers give a better standard of training for those who later go on to “do it themselves”. That’s also why asking whether providers are “badged” makes greater sense now. AAIAC urges you to do your bit - when you can please. AAIAC = The Adventure Activities Industry Advisory Committee. DfES = the Department for Education and Science now the DCSF = the Department for Children, Schools and Families.